Happy Birthday to June UX: One Year Old! 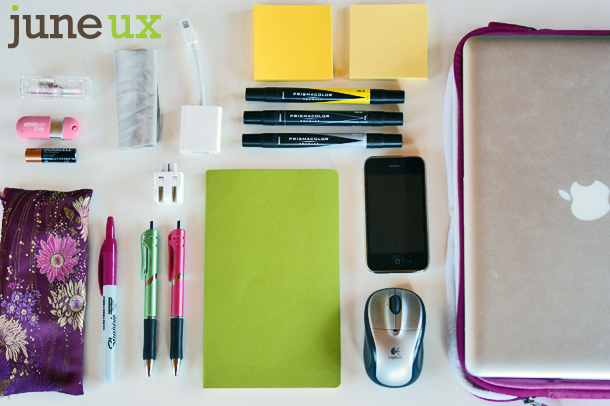 My little company, June UX, is turning one! Never has a year gone by so fast. Here is a recap of how it began, what I did, who I met and what I plan to do next. The No. 1 driving force behind my decision to go independent last February was my family. I constantly felt like I was letting them down, but neither did I feel like I was giving 100% focus to my job. “Me” time? I didn’t even know what that was. Starting my own business has been food for my soul. People often ask me about the story behind “June UX” and how I came up with the name. I began with the tagline: happy user experiences. (It’s what I make!) From there, I daydreamed about the things that made me the most happy. As a Minnesotan – where it’s winter 6 months out of the year – summer easily tops the list of things that make ALL of us here happy. After staring at a bunch of summer-y words awhile, something about “June” felt right to me. The “UX” part was easy… In my field, user experience is commonly abbreviated as UX. I didn’t purchase everything you see here at once, but the majority was picked up right away. There definitely were several trips to Apple and Best Buy in those first few weeks. MacBook Pro – I honestly wanted to get a PC laptop for my business, but the reviews varied so wildly from fantastic to lemon that Apple soon became the only option I had confidence in. As an Apple-owner for the past 25+ years, I figured I’d have no trouble being my own tech-support. Windows – Operating system for Mac. For me, Visio is a personal must. So in order to use it, I had to essentially split my MacBook into 2 hard drives. Visio – Wireframing tool (PC only). I’ve been using Visio for more than 4 years now and personally think it’s the most comprehensive and most flexible of the diagraming tools. One of my favorite features is the ability to bring in images & crop them right there. Microsoft Office – I use PowerPoint and Excel routinely for presentations and analysis, Word to create worksheets and other tools, and Outlook for e-mail and scheduling, of course. Photoshop Elements – Photo and image editor. To be able to edit PSD files and optimize graphics for the Web ; used mostly for maintaining my own site. It’s missing some features I adore from the full-version, but it does the job. Omnigraffle – Wireframing tool (Mac only). Only used when required by a client. SnagIt – Screen capture tool. I take thousands of screen captures, so having a good tool saves me time and headaches. The only thing it doesn’t do well is capture scrolling PDF documents. VGA Adapter – Connects MacBook to projectors. WordPress & Genesis Theme – Blogging platform and WordPress skin. I’m still a newbie with a lot to learn, but I was very surprised at the steep learning curve of WordPress. I’ll share what I learned the hard way in a future blog topic. Sony DSLR – Digital camera. For taking photos of artifacts and research participants. Business cards – Ordered from Vistaprint, the cheapest online printer I could find. Fancy cards will have to come later. Professional headshot – Maris Ehlers Photography. I wish I had known Maris when I had gotten married so she could have photographed my wedding portraits also. Moleskine notebooks – For taking notes during client meetings. I bought them because everyone on Twitter raved about them; now I think they were all paid spokespeople. I don’t “get” the passion people have for Moleskine. Please explain it to me. Whiteboard – Keeping everything organized in Outlook and my own calendar system quickly became overwhelming. Having an at-a-glance resource center has made a huge difference in my sanity. Web hosting – Aplus.net, recently bought out by Deluxe. I’ve been using Aplus for almost 7 years for my other websites, and like them a lot. Their tools are easy to use and their customer support is amazing. Lawyer fees – I became an official LLC in October 2011. Markers – Used for sketching ideas during client meetings. I bought fine-point Sharpie markers, plus some thick artist-quality markers in black, gray and yellow. Roll of white paper – Used for sketching during client meetings. IKEA sells them for 5 bucks. Content Rules by Ann Handley & CC Chapman. I have recommended this book to all of my clients. I’ve read numerous books about content and content strategy and can honestly say, if you only buy one book about content – this is the one. Measuring the User Experience by Tom Tullis & Bill Albert. There are tons and tons of books and blog posts about conducting usability studies, but none of them go into great detail about the analysis phase. This book is 100% devoted to it. It validated many of my approaches, plus gave me ideas on more ways to dissect usability data. The Art of the Start by Guy Kawasaki. I enjoyed his advice about hiring employees, and will be sure to reread that chapter when I get ready to hire my first employee. Thank you to everyone who supported and believed in me – there are many, many of you. Thank you for your friendship, your partnership, your business and your word-of-mouth marketing on my behalf. Most of all, I thank my husband. He never once questioned or showed the least bit of apprehension about our life-changing decision. Website looks great! Nice work, girlfriend. Congrats Kristine! You’ve been a great partner. Congrats on being 1 year old. I miss working with you.